For a nation who are considered pretty down-to-earth, straight shooting folk, you’d be surprised at juts what kind of weirdness goes on throughout Australia. I was intrigued to get involved with some of the most madcap festivals that the country has on offer so last year I headed down under, flew about, rented some cars from Budget and headed throughout as much of the land as I could to explore some of the crazy festivals that the country had in store and I wasn’t disappointed, here’s what I found. Chinchilla is the melon capital of Australia and in the late 80s there was a terrible drought which meant that production ground to a halt. Once the drought was over, the town organized a festival of all things melon-y and the results are awesome. Each year the town and tourists gather for a melon appreciation day which sees them compete in a range of activities that are based around, you’ve guessed it, melons. Here you will find melon skiing, pip spitting and eating contests as well as melon hats and memorabilia. Truly a festival like no other. In what is a beautiful combination of sustainability and madness, each year Darwin runs its Beer Can regatta which sees inhabitants collecting all of the littered beer cans that are left on the beaches, and turns them into sea-worthy crafts which pit themselves against the other entrants. 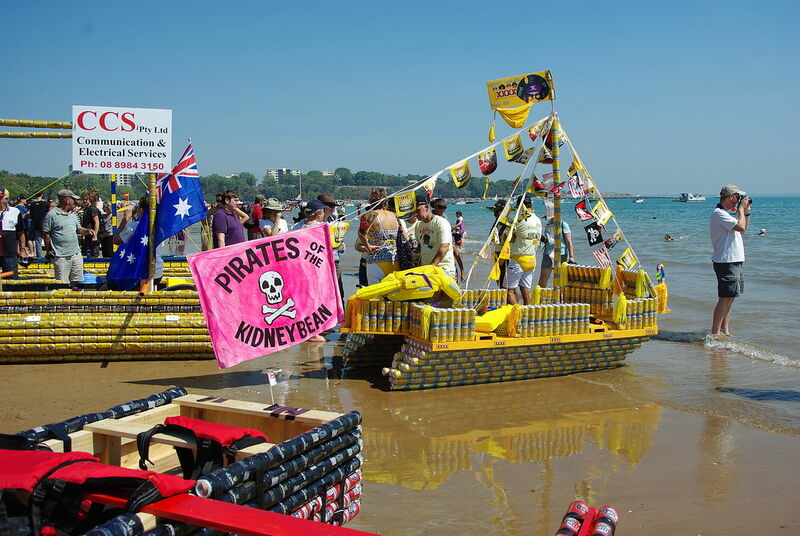 Winners of the regatta are not only judged on their ability to float but also their design which has led to some incredible, beer can masterpieces over the years. Whilst horse racing does exist in Australia, the locals of Alice Springs have flipped the idea on its head and since around 1970 decided that camels are far more fun to race. The Uluru Camel Cup is a coveted trophy for which many practice all year to win, these feral beasts are highly populous in Australia and they can reach some truly incredible speeds. The highlight of the Singleton Agricultural Festival is the wife carrying competition, an idea first conceived in Finland but one which offers sufficient madness for the Aussies to jump on to. The wife carrying competition is more than just a race, entrants must not only hump their Sheilas to the finish line fastest but maneuver through a tricky obstacle course along the way. Once nothing more than an entertaining event, entrants these days take the competition far more seriously and the winner is highly respected. Not just any seafood festival, the Tunarama Festival in Port Lincoln likes to add some real fun and games to they appreciation to all things marine life. At this festal you will find the high class side of things with oyster-sipping and fine dining and then at the other end of the spectrum you will find muscle-bound men hurling a frozen tuna fish to see who can throw it the furthest, true madness. I would recommend that if you are visiting Australia this year then you check out which of these crazy festivals is on the calendar during your stay to appreciate a whole different side to the country.